Understanding child to parent violence: an introduction. 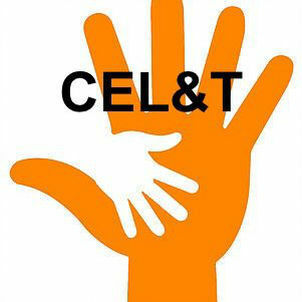 CEL&T (Children Experiencing Loss and Trauma) is a Private Limited Company providing information for anyone wanting to know about loss and trauma and the impact upon children. They work in partnership with several organisations regionally and nationally to provide collaborative working in order to support a wide range of children and young people from a range of diverse home environments. For details of all CEL&T online CPD training courses, INSET days and Key Note presentations, please see the website. 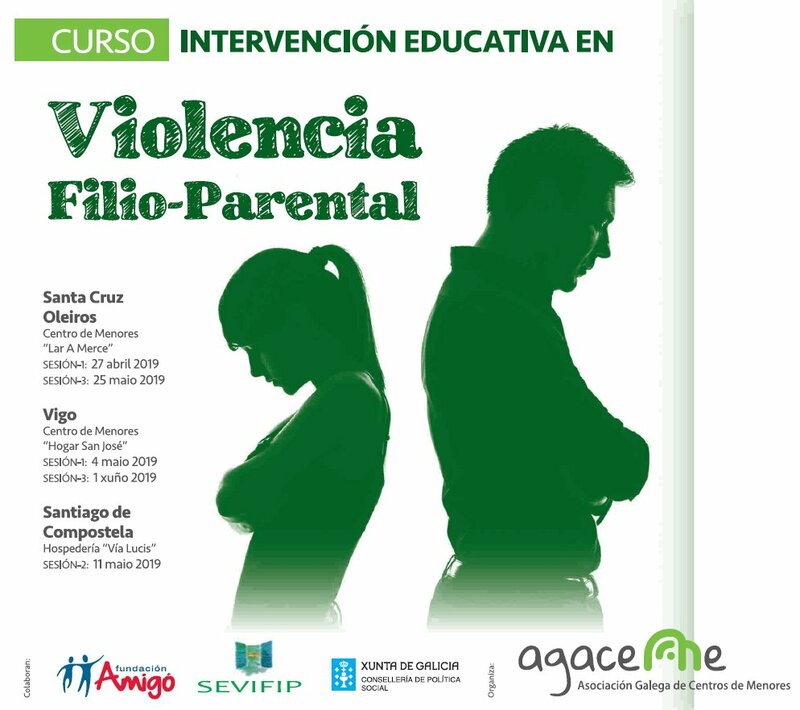 Colaboramos en la organización del curso “Intervención educativa en violencia filio-parental”. Si quieres mejorar tu formación, rellena este formulario (http://bit.ly/2ImhKUa ) y envíalo a secretariatecnica@agaceme.com. Inscripciones hasta el 25/04. A one-day introduction to NVR, 7th September in Northampton. This is a workshop for anyone who lives with or works with violent and destructive young people who do not respond to traditional reward and punishment/behaviour modification approaches – Parents (Biological, Step, Adoptive and Foster) and Professionals (Mental Health Professionals, Teachers, Social Care Professionals and Youth Service Professionals). Training sessions for social workers / practitioners in CPVA and NVR, in Galway, with Declan Coogan and Eileen Lauster. These include a new Postgraduate Certificate in NVR through the University of Ireland, Galway, starting in March. See the CPVIreland website for more details of training opportunities. This is a 3 hour Certificated CPD training and discussion seminar/ workshop which includes why children and young people display CCVAB, families that might experience CCVAB, the age of children who can display CCVAB and how can we support/ live with children who display CCVAB through self-resilience. There will be opportunity for discussion and evaluating options available to support families and children. All attendees will receive a Certificate of Attendance (CEL&T are members of CPD UK). Regular dates throughout the north east. An interactive practical day’s training designed to raise awareness of the topic and provide practitioners with an opportunity to explore the dynamics of the issue as a profile of domestic abuse. This training is offered in London in partnership with RESPECT, and now also in Gloucestershire, in partnership with Gloucestershire Domestic Abuse Support Service (GDASS). More details about this training package, including prices, can be found on the AVA website and by contacting the Training and Events Coordinator. 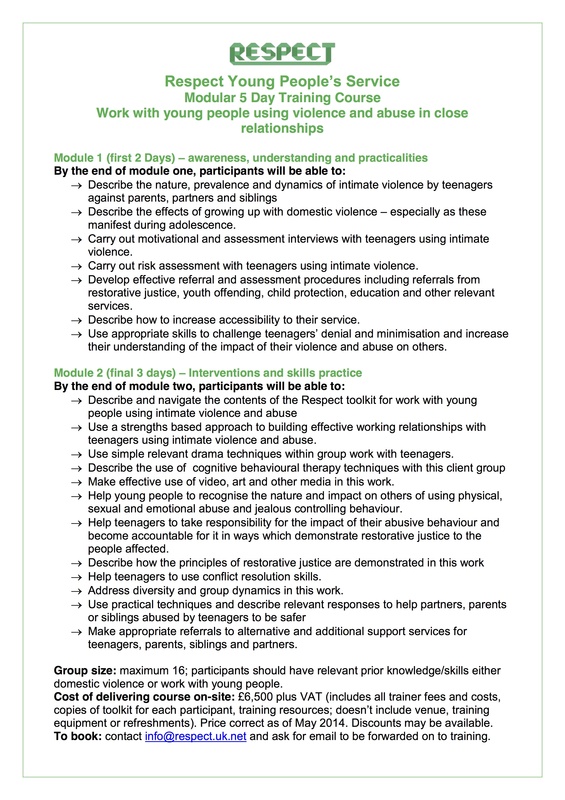 Respect offer three separate training packages regarding young people’s violence. 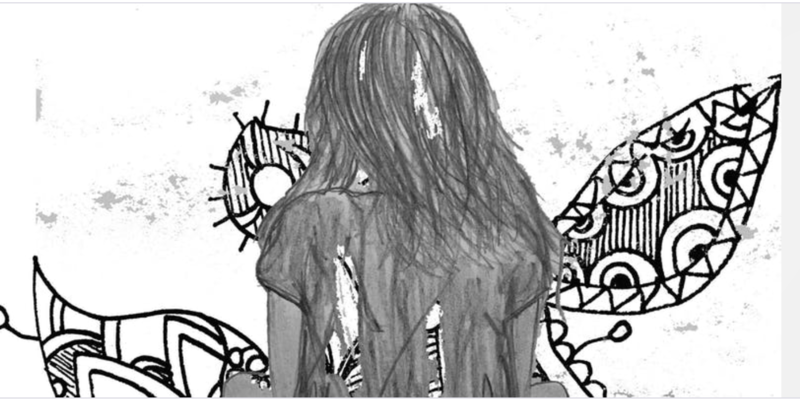 Perspectives on Adolescent to Parent Violence (one day) is offered in partnership with AVA. Working with Young Peoples’ Violence in Close Relationships is a five day course to train participants in the use of the Respect toolkit. Both these courses are available for delivery any where in the country. They are also offered as open-access courses in London. Next ONE DAY course on Adolescent to Parent Violence: June 19th, in London. Next FIVE DAY course: 13th – 17th May, in London. For more details see the Respect website and Eventbrite. THE RESPECT YOUNG PEOPLE’S PROGRAMME (RYPP): an evaluated programme for working with families experiencing child and adolescent violence and abuse towards parents. Cathy Press and Carole Baker offer a Multi-Agency Three Day Facilitator Training course for the WHO’S IN CHARGE? parent support programme. Cathy and Carole are the UK approved trainers for this course. Please see the Who’s in Charge? website for more information about both Cathy and Carole, about the Who’s in Charge? programme and about training opportunities. This CPD certificated training is aimed primarily at those intending to facilitate the Who’s in Charge? group programme, although it has practical application to those working 1:1 and with parents generally. The workshop is largely experiential, based around the exercises and discussions of a Who’s in Charge? group programme. Dates have been fixed for Facilitator Training around the country in February, June, September and November 2019. ON COMPLETION OF THE THREE-DAY FACILITATOR TRAINING PARTICIPANTS WILL BE ELIGIBLE TO RUN THE WHO’S IN CHARGE? PROGRAMME AND WILL GAIN ACCESS TO ALL THE PROGRAMME MATERIALS NEEDED TO RUN THE NINE WEEK PROGRAMME. THERE ARE NO FURTHER LICENCE FEES, ENABLING PRACTITIONERS TO RUN PROGRAMMES IMMEDIATELY. Cost for the training will be £650.00 per person including course handouts, beverages throughout each day and access to the facilitator pack which contains all the materials needed to run the Who’s in Charge? Programme. Lunch is not provided. More details of all of these, and booking form, on the Who’s in Charge? website or on the listings below. PLEASE NOTE THAT YOU WILL NEED TO BOOK FOR EACH OF THESE EVENTS. The Third National NVR UK conference will be taking place on 28th June 2019, in Southampton. Keynote speakers include Peter Jakob, Elisabeth Heismann, Julia Judd and Liz Day. Booking via Eventbrite. 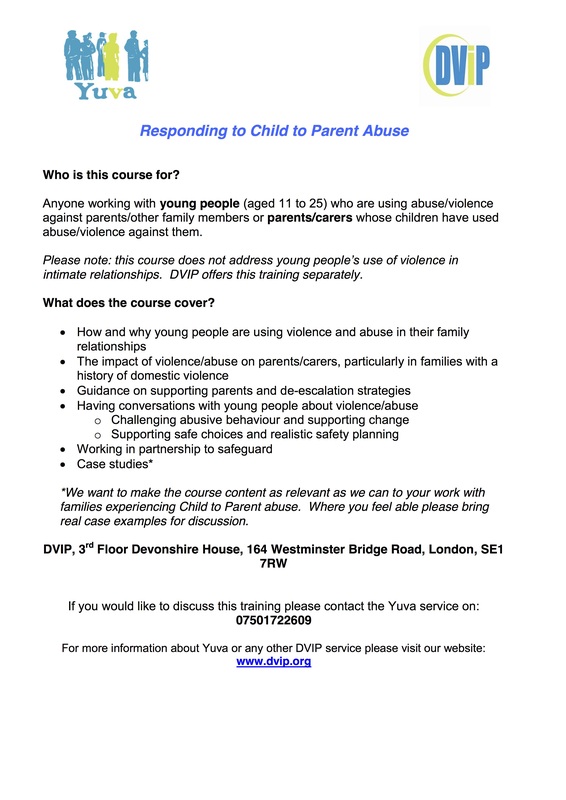 DVIP run a range of training courses concerned with domestic violence, including a one day course on Responding to Child to Parent Violence. This course can be booked for your organisation, or applications are invited to attend the course when it runs in London. Further details and booking form on the DVIP website. Training dates for 2019 have now been announced! 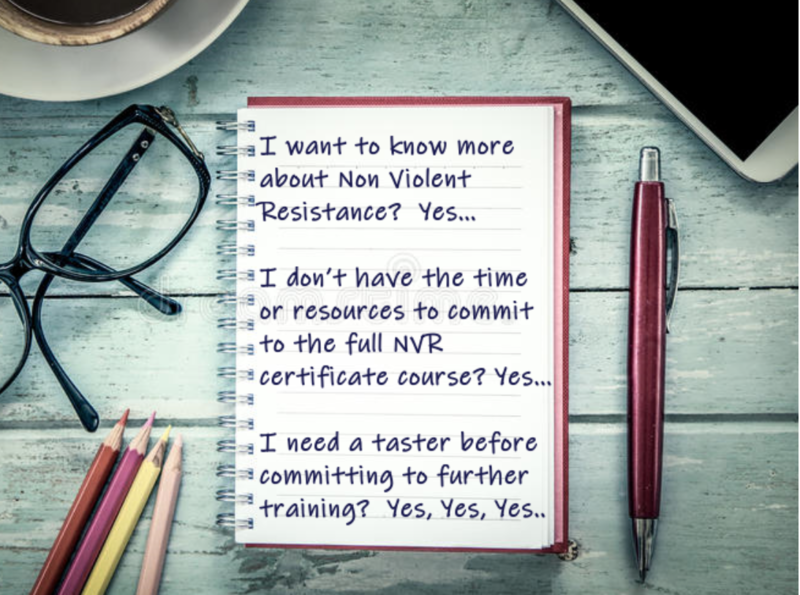 Partnership Projects offer a programme of introductory and specialist seminars and masterclasses in Non Violent Resistance (NVR) in London and around the country. Information is now available for all introductory and specialist courses running in 2019, These courses book up well in advance! Details here for London in September. If you can answer YES to any of the above questions then our brand new FULL DAY INTRODUCTORY WORKSHOP is right for you. We will be running these just twice a year in London, with the next one in March. We even provide full catering as part of the price which is just £62.50 per person + VAT! Don’t wait too long to book as places are strictly limited. This workshop / presentation is tailored to professionals in local authorities, mental health and the independent sectors. Parents who wish to work in a voluntary capacity in NVR, e.g. by supporting other parents as mentors, are welcome to attend but should be aware of the professional nature of the workshop. There are limited places available for this training. Adolescent to Parent Abuse (APA) is a ‘Pattern of aggressive, abusive and violent behaviours across a prolonged period of time’. APA ‘creates an environment where parents live in fear of their child and often curtails their own behaviour to avoid conflict’. Kicked holes in doors, walls & furniture. Made threats to kill themselves or other family members. Used weapons as a way of getting their own way. Physically attacked family members causing injury. This one-day awareness training will offer the opportunity to globally consider parents/carers/grandparents impacted by violence and abuse from their child. 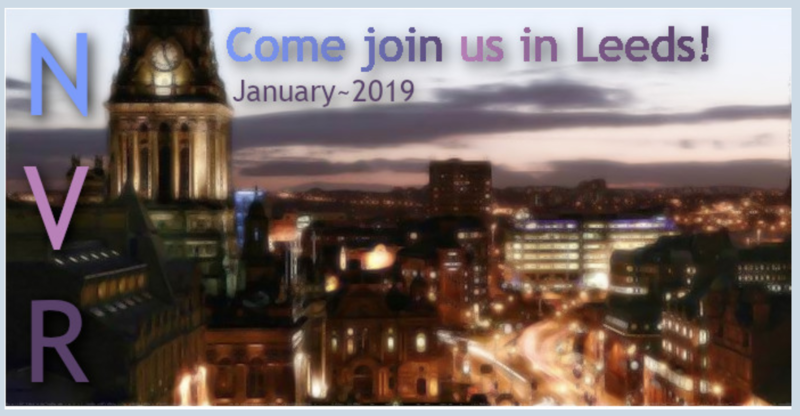 It will offer space to consider the difference between adolescent to parent abuse and ‘normal’ teenage behaviour, discuss case studies and look at strategies used to support families impacted. “Excellent training, interactive and gave a wider understanding of resources available”. Trainer Information: Jane Griffiths has worked with families for over 25 years, she has worked in the field of domestic abuse for 14 years and specialised in Child/Adolescent to Parent Abuse for over 8 years. She was involved in the development of the internationally recognised programme Break4change © As well as managing the local delivery of Break4change in Brighton and Hove, Jane has been a speaker at conferences, radio and TV discussing the issues around Adolescent to Parent Abuse. RISE is a Domestic Abuse charity in Brighton. RISE co developed the Break4change programme. The charity also offers services including: refuge, therapeutic support, peer support, training and one to one services for women, children and boys up to the age of 18years. Phoenix Domestic Abuse Services, based in Blaenau Gwent, offer a range of training options for professionals, including Adolescent to Parent Violence. See the website for more details. For those interested in learning more about issues around adoption, including aspects of violence, PAC offer as series of public seminars, training for adoptive parents and carers, and CPD opportunities around the country. These include training in Non Violent Resistance, as well as issues to do with Adoption Disruption, Adolescence and Attachment. Details of training through 2018/2019 available on the PAC-UK website. Full details about the services available can be found here. 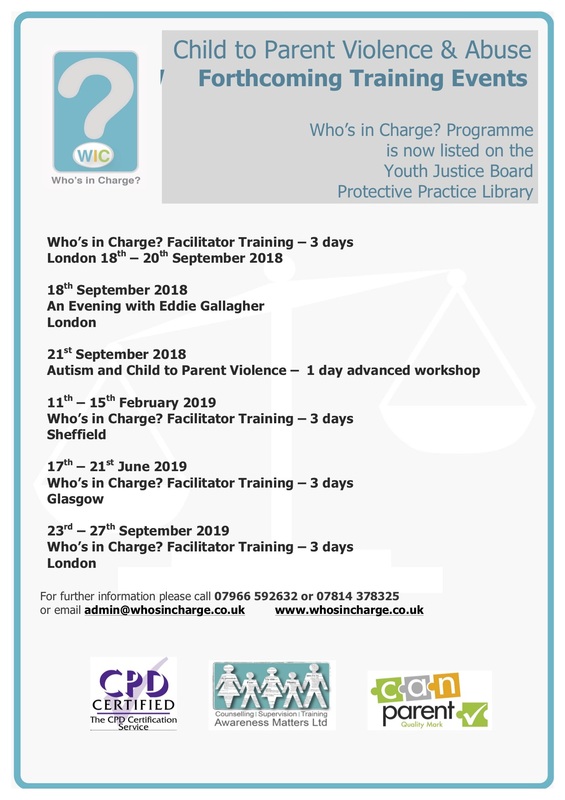 Adoption UK offer a full programme of training events for families, including the use of Non Violent Resistance, and a workshop called Above and Beyond, details here. Funding has recently been secured to provide workshops for families in Edinburgh and Aberdeen. See here for details of the next training day in SouthWales. Sarah Fisher is a trainer, NVR Practitioner, and adoptive parent who offers NVR training for parents and professionals. Sarah offers both face to face and online courses with weekly calls. Further details are available on her website. 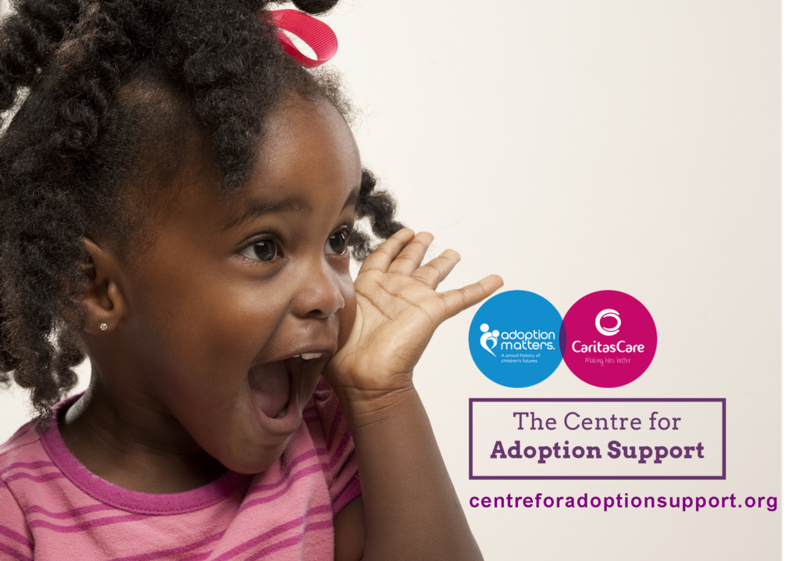 The Centre for Adoption Support offers workshops on Child to Parent Violence, for adoptive families managing physical and verbal aggression at home. See the newsletter, available via the website, for more information. The New Authority Network International has been established by a team of NVR practitioners at Schneider Children’s Medical Centre of Israel, to promote the advancement of ideas and to provide a space for professionals to connect and share knowledge about NVR and New Authority. They offer a programme of conferences and training days, around the world, led by the team. You will find more information and full details of the training on the NANI website. The NVR Practitioners Consortium website offers lists of practitioners, as well as details of upcoming courses. The National Association of Therapeutic Parents, based in Gloucestershire, works with both parents and professionals to promote better outcomes for children who have experienced early trauma. They offer a range of training courses and events around the country. Yvonne Newbold and Mark Brown have developed a series of training days looking at Autism and Learning Disability Behaviour Help. Yvonne’s session, How to Reduce Violent and Challenging Behaviour in SEND Children, provides very practical guidance in this difficult area. Yvonne makes a clear distinction between child to parent violence and violent challenging behaviour, but many of these issues will resonate with families where there is significant overlap. Further details about these training days, and other similar events, can be found on Yvonne’s website and through Eventbrite. 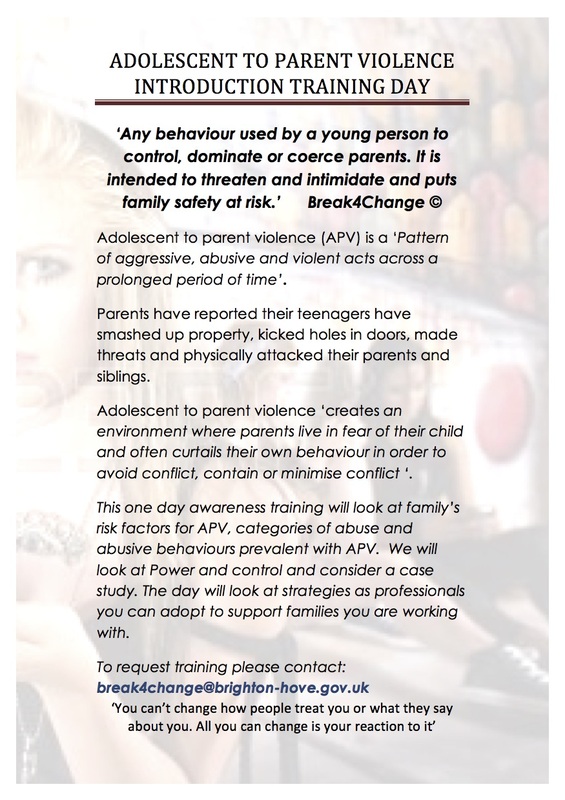 Break4Change, one of the original providers of a specific support programme in Britain, now offer training opportunities for those wanting to know more about Adolescent to Parent Violence. Both a half-day Basic Awareness, and a one-day Introduction training course are available.